Today's Sunday Stamping challenge is Art Nouveau. Guess we're getting fancy all up in here. I had to Google it. 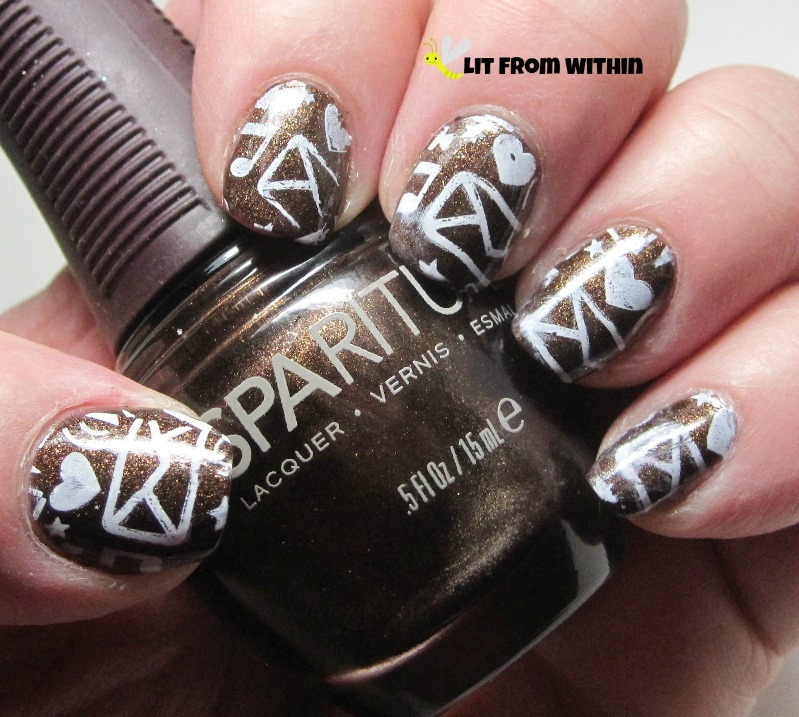 Today, I have my last book-inspired challenge mani to share with you. 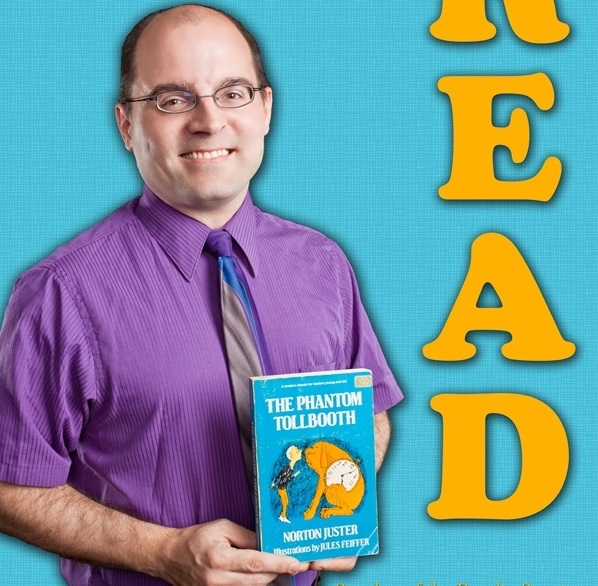 I couldn't resist picking my husband's favorite book, The Phantom Tollbooth. He even got his picture taken with it for a READ poster for his University's library! 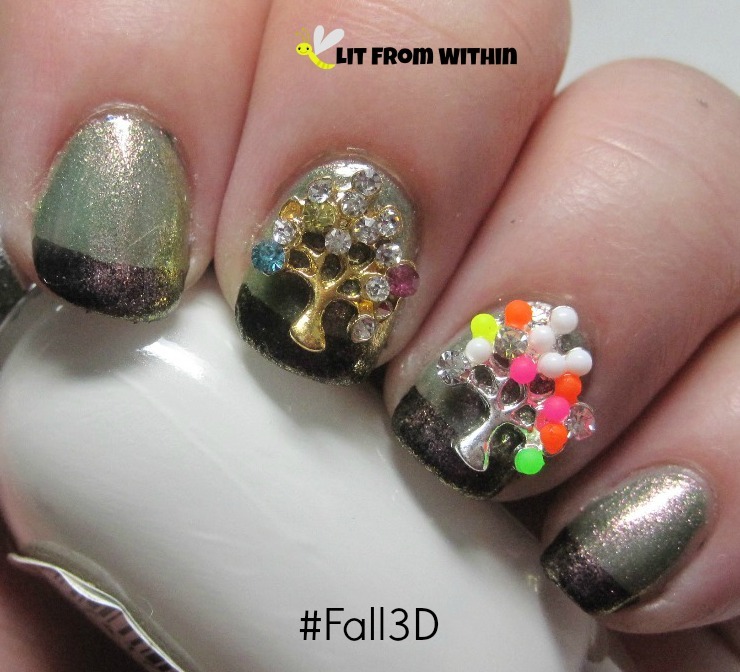 Today's the last day of the November Challenge Your Nail Art Fall-ing for Nail Art Challenge! I have So.Much.Win to show you today. 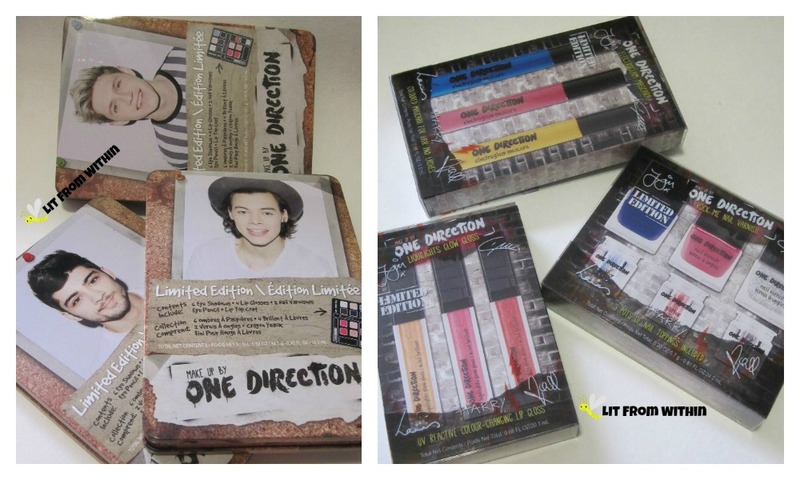 Remember when I told you about the first One Direction kits? These are so much better. 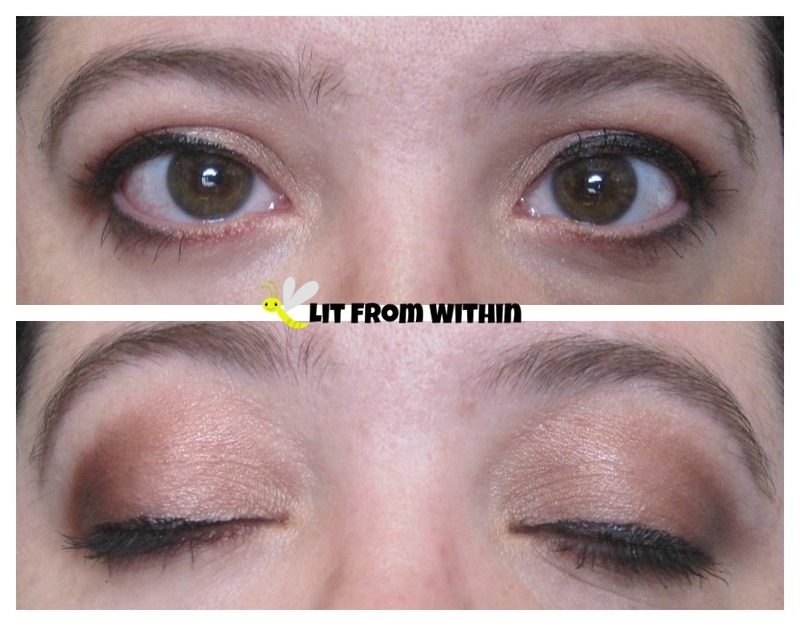 Buttery, soft shadows, UV-reactive glitters and lippies, and bright mascaras! There's a lot of pictures, and swatches, too! 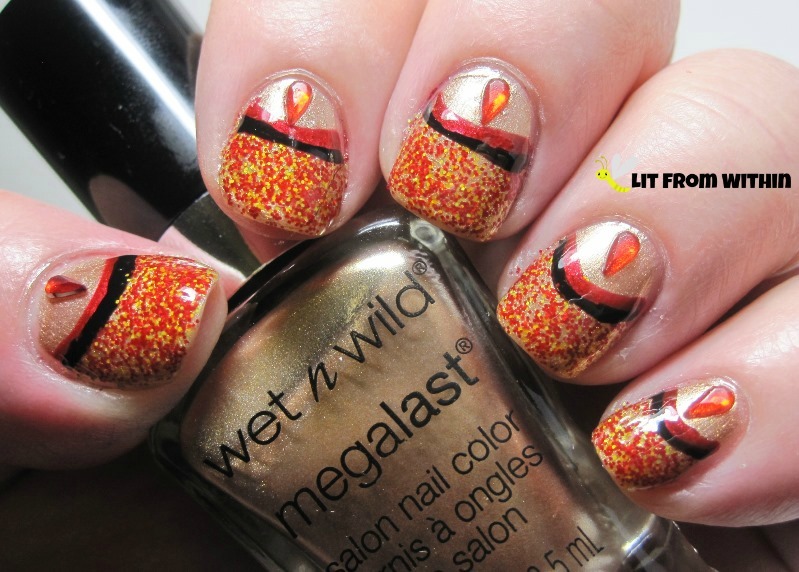 Today's Challenge Your Nail Art prompt is for Fall Colors. 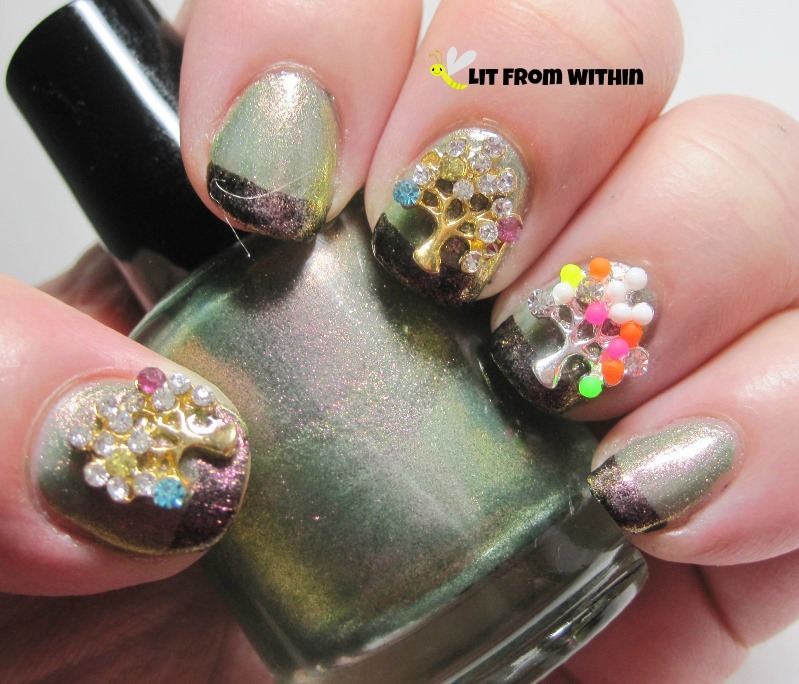 I did this mani for a nail group I'm in, for a Fall Glitter look, and thought it would work for today's challenge, too. I love the gold and red together, with a stripe of black. I laid down a base color of Wet 'n Wild Pot of Gold, and then added Candy Lacquer Big MacIntosh to the bottom 2/3rd of the nail. Swish of red and black striper, popped on a red rhinestone, and Bob's your uncle, and Fanny's your aunt. 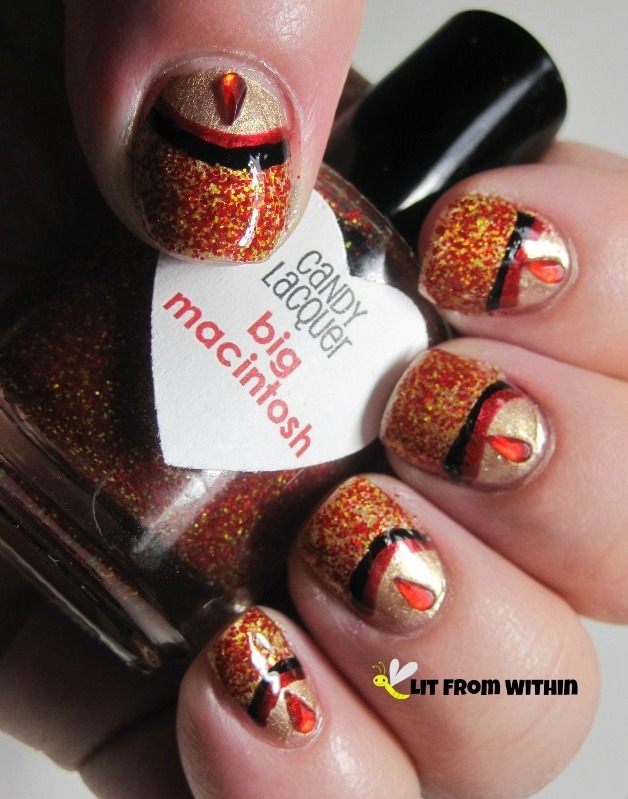 Bottle shot: Wet 'n Wild Pot of Gold, Candy Lacquer Big Macintosh, and nail art stripers in red and black. 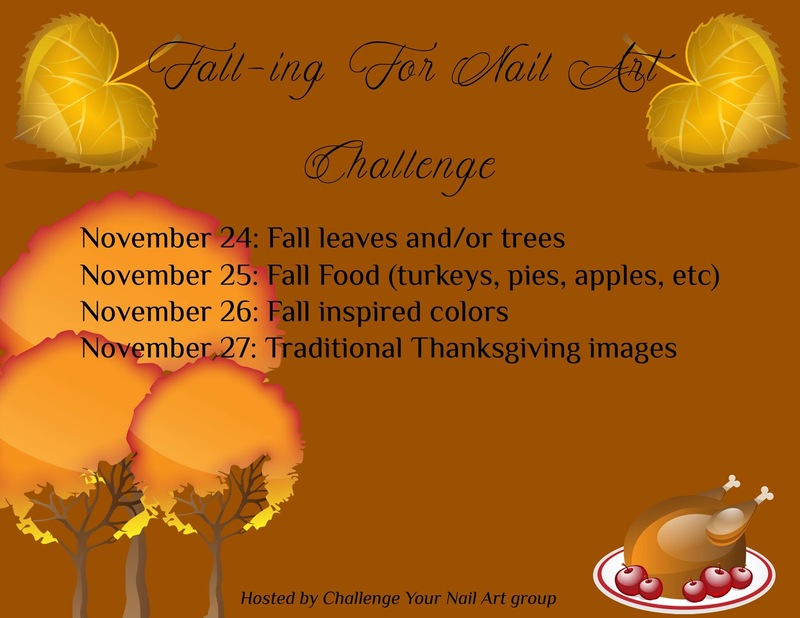 Today's Challenge Your Nail Art prompt is for Fall Food. Nothing says Fall to me more than baking! It's too hot here in Florida to do a lot of baking in the summer, anyway, but the really good apples don't get ripe until the Fall. 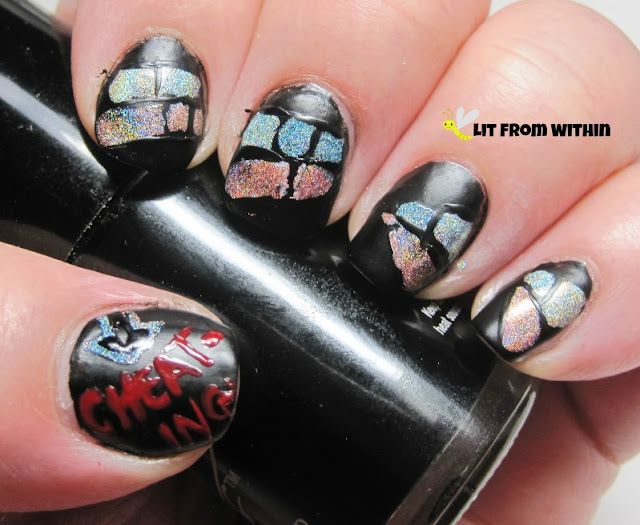 So when I saw this nail art (original author unknown) for cherry pie, I thought, well, I'd rather have apple. 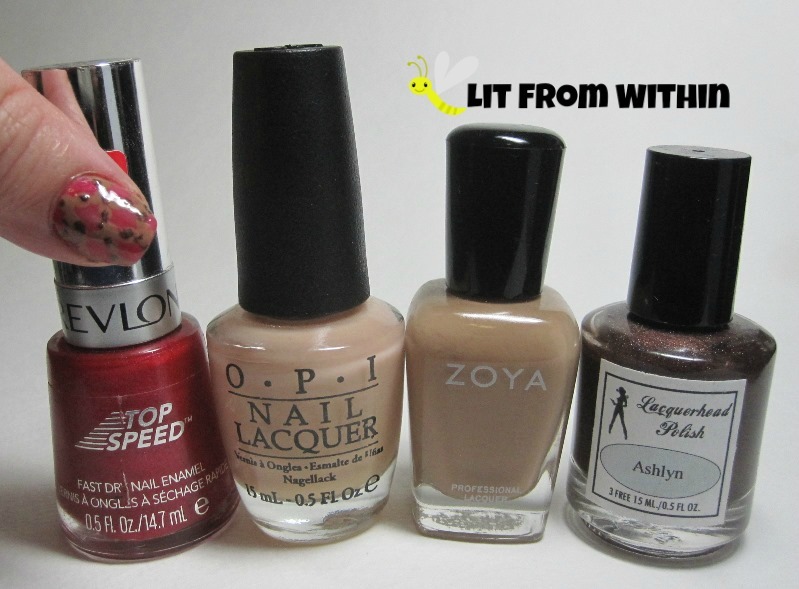 I started off with Revlon Orient Express, but it was too red, so I put a layer of OPI Glints Of Glinda over it, which gave it a milky, softened look that was more like what I wanted. 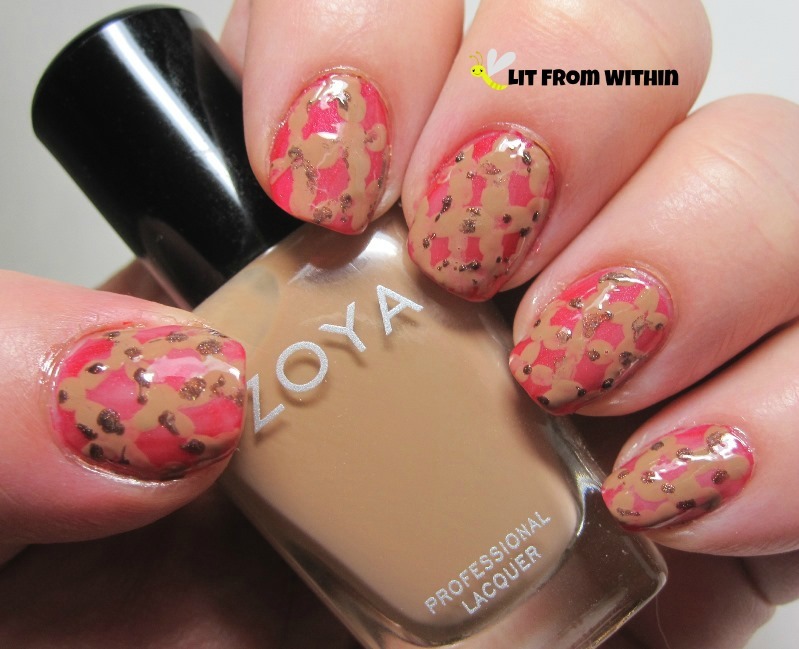 I used a short brush to daub Zoya Flynn in a cross-hatch pattern, like a lattice-top pie. To give it more dimension (and golden-brown deliciousness,) I added little spots of Lacquerhead Polish Ashlyn, a dark brown holo. Yeah, it still looks like a cherry pie, I guess. Which is okay. It's still pie, after all. 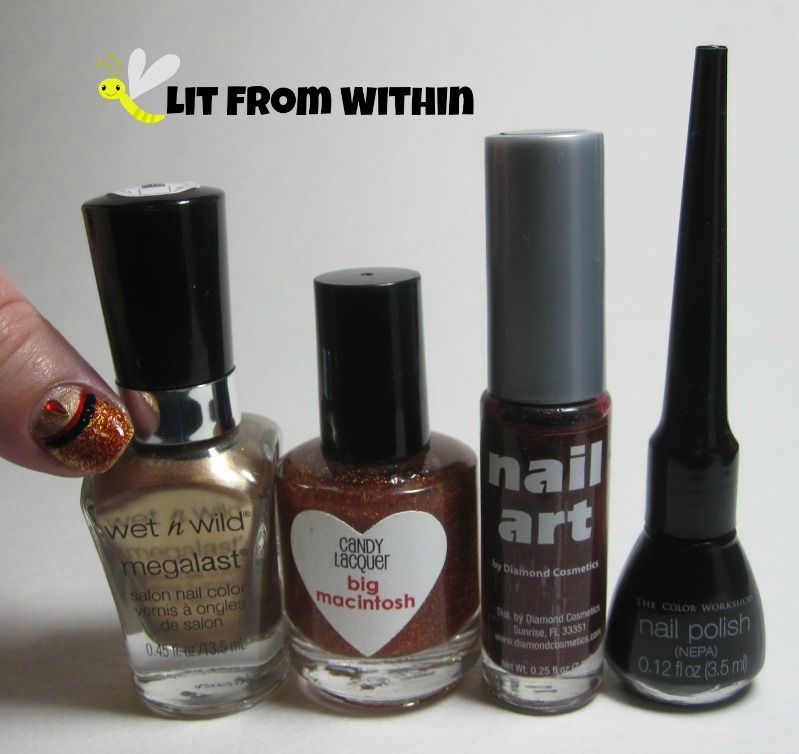 Bottle shot: Revlon Orient Express, OPI Glints of Glinda, Zoya Flynn, and Lacquerhead Polish Ashlyn. Will you be indulging in a little pie this week? What's your fave? It's so hard to decide, but a good peach pie is hard to beat! What's the big deal about eye creams? Our eyes are surrounded by some of the thinnest and most delicate skin on our bodies. Our eyes tell our age before almost anywhere else! Not to mention, with the amount of time we spend on our computers, or simply not getting enough rest, our tired eyes can get puffy and develop dark circles. 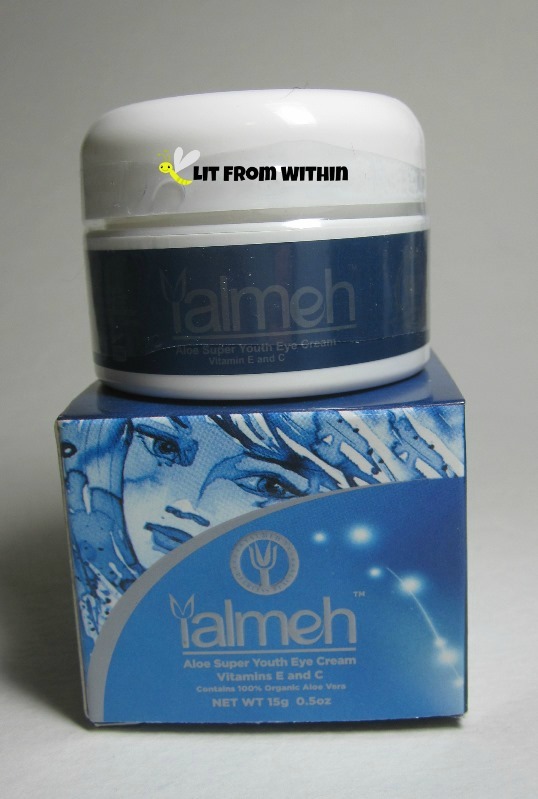 No eye cream is the Fountain Of Youth, but Yalmeh Super Youth Eye Cream definitely has some benefits! Two posts today! First up, it's time for the next Challenge Your Nail Art monthly challenge! 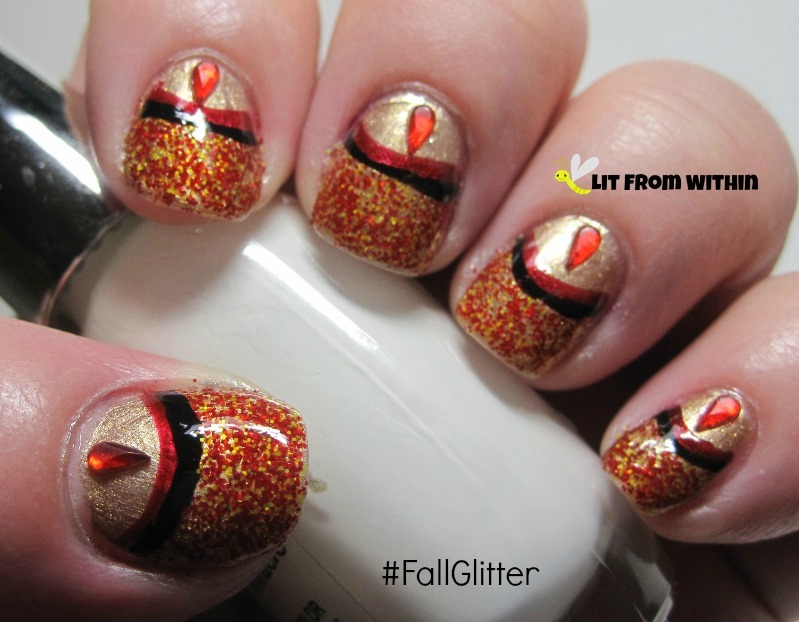 This month's about Fall-ing for Nail Art, and today's prompt is fall leaves or trees. 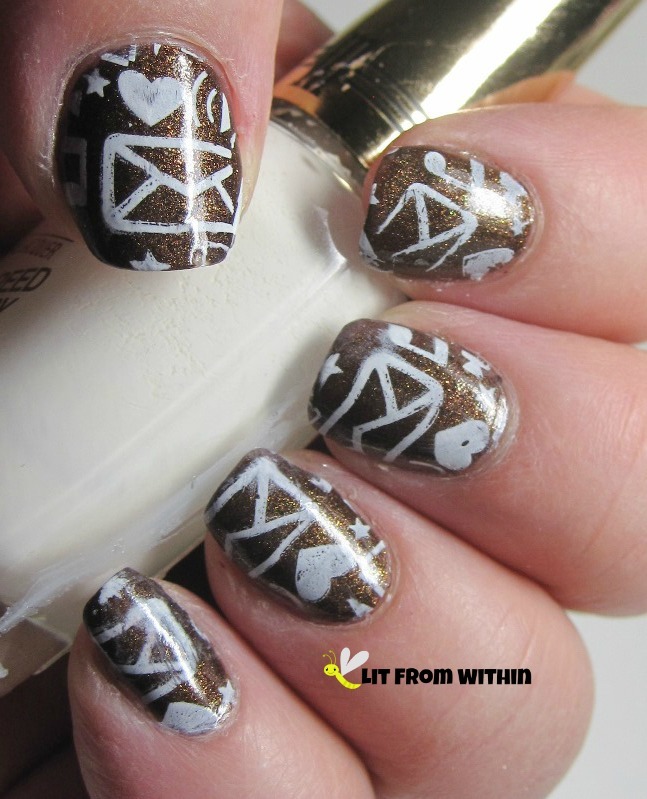 I did this nail art for a Facebook group, but have been waiting to share it on the blog - seems perfect for today's theme! I wish I had done a better job cataloging what Indie I used. I know I did a simple black tip and then covered it all with this green with purple shimmer. The charms came from a couple of different ebay sellers. Y'all know how I love to stick random things on my nails! We get only a very little foliage change here in Florida, but I still have a bunch of leaves all over my yard.. and pine needles. Tons of pine needles! Check back in a bit for my second post - an eye cream review! Today's challenge is "I'm Thankful For" Thanksgiving nails! 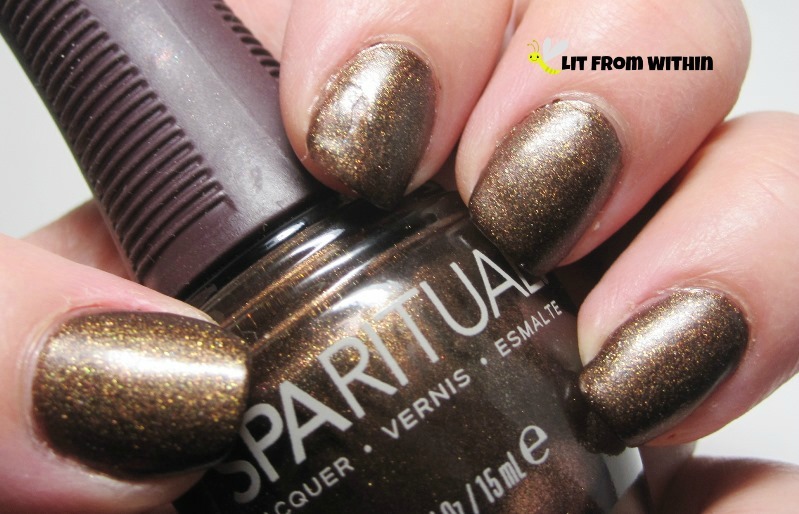 I needed a base polish that just reminds me of the season, so I picked this unusual matte brown glitter polish from SpaRitual with an even more unusual name - Starry Night. You would think that would be a black or blue polish, not brown. It's super pretty, though, and dries down to a matte finish. I didn't want to do traditional turkey stamping today, so I thought about what I'm really thankful for, and top of my list is the love of my husband. We met online in what constituted social media in the early 90's, but we started falling in love when he sent me some mix tapes, and a lot of handwritten letters. 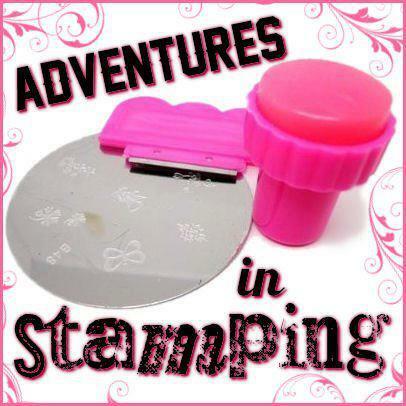 So when I saw this stamp on Cici & Sisi 11, I thought it had a lot of the elements that made me think of those early days of our relationship - hearts, envelopes, and music notes! It should have some $$ too, though, because back in the day, making a long-distance phone call cost a lot of money, and my monthly phone bills would be in the $300 range. In the 90's. Turns out it was a good investment, though, since we've been married 19 years. He doesn't write me letters anymore, but he still finds me music that he thinks I'll like. I'm thankful also, if you read this far! What are you thankful for this year? 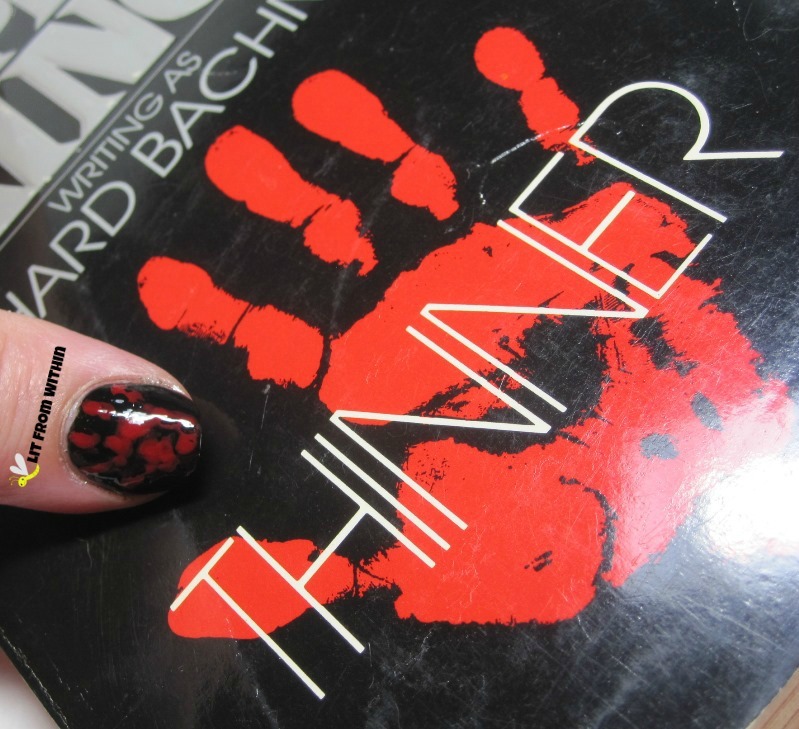 I patterned my very simple nail art after the cover. 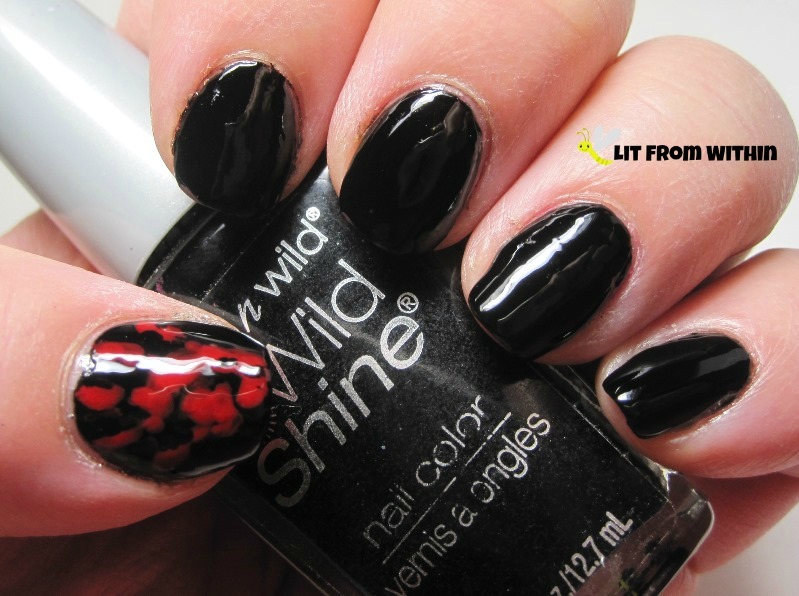 I used Wet 'n Wild Black Creme, and then free-handed a hand print on my thumb with OPI Over and Over A-Gwen. I'm pretty proud of how the handprint came out. It was my first one. What do you think? Does it look like the cover to you? Do you still read books from the same authors that you read when you were a kid? 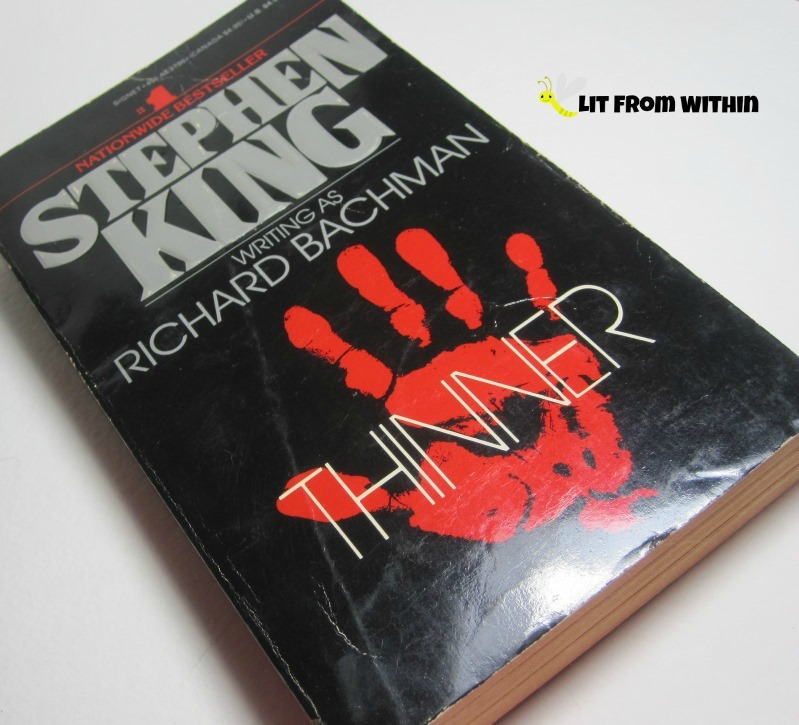 I don't really read Stephen King anymore, but I loved Richard Peck as a kid, and I still go back and read his stuff. Would you like some more...hyaluronic acid serums? Personally, I can't get enough serums, and love trying new ones. My skin drinks them up, and, even if my knees tell me that I'm 800 years old, my face isn't ready to admit that I'm in my 40's! 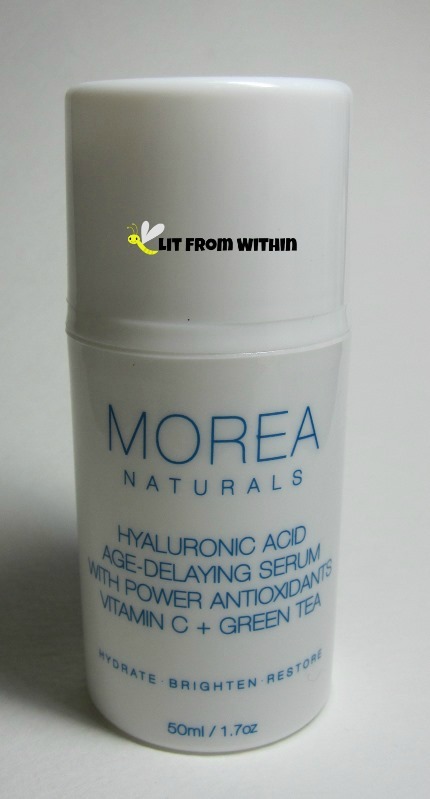 I'm excited to share with you my experience with Morea Naturals Hyaluronic Acid Age Delay Serum With Vitamin C + Green Tea and my homage nail art! I remember when hearing that someone was "getting a peel" meant that they were going to a dermatologist or aesthetician, or maybe a fancy spa. 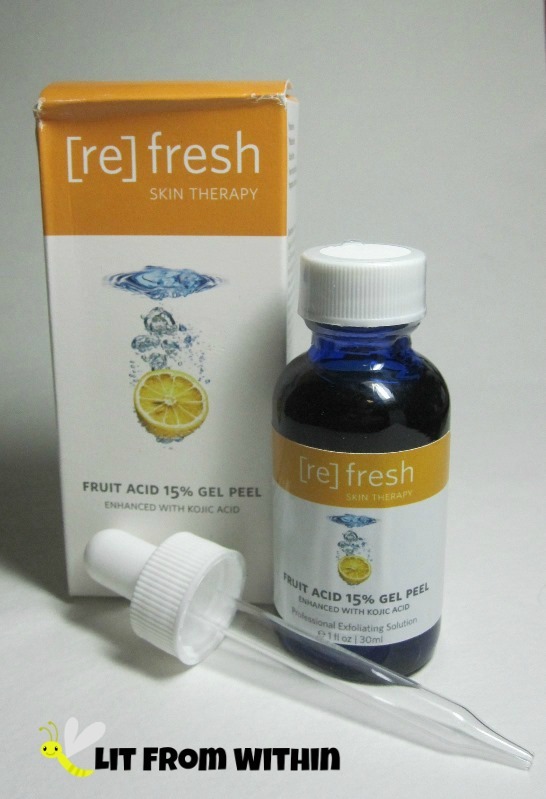 I'd never had a peel done before, so when I got the opportunity to try [Re]fresh Fruit Acid 15% Gel Peel, I was pretty excited for a trip to my home "spa"! 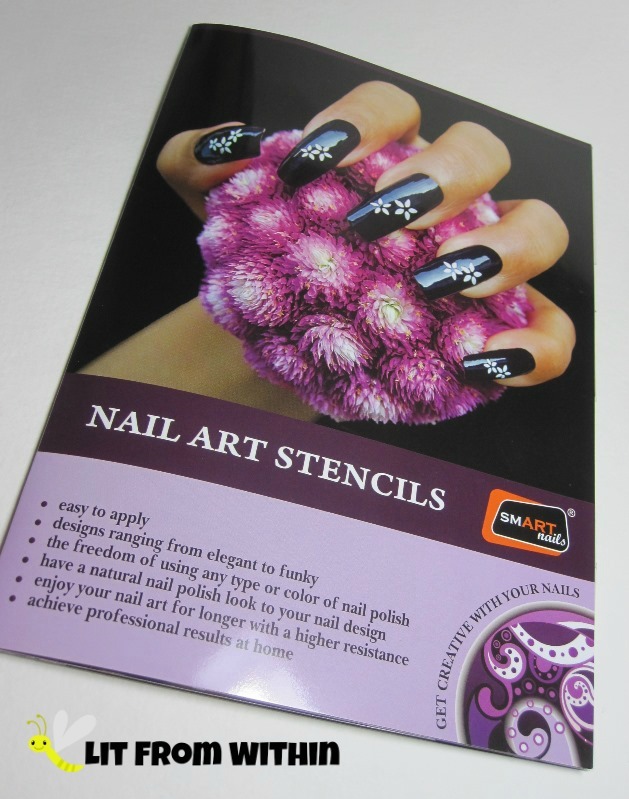 Y'all know how I love my nail art - freehand, stamping, and now, STENCILS! 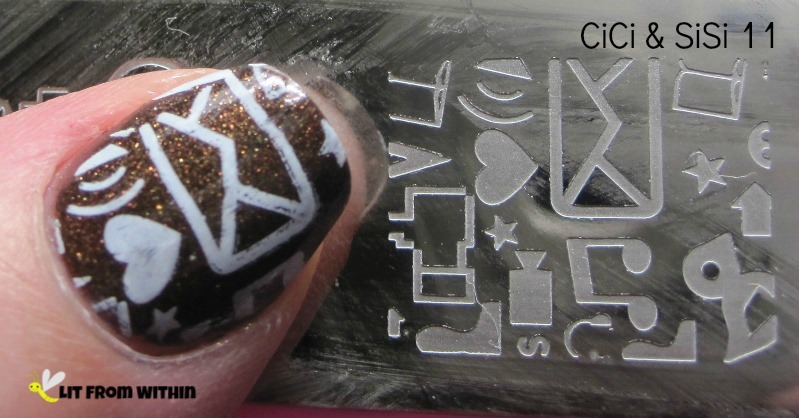 I had the opportunity to try out some fun stencils from SmART Nail Art, and I can't wait to show you how easy they are to use. 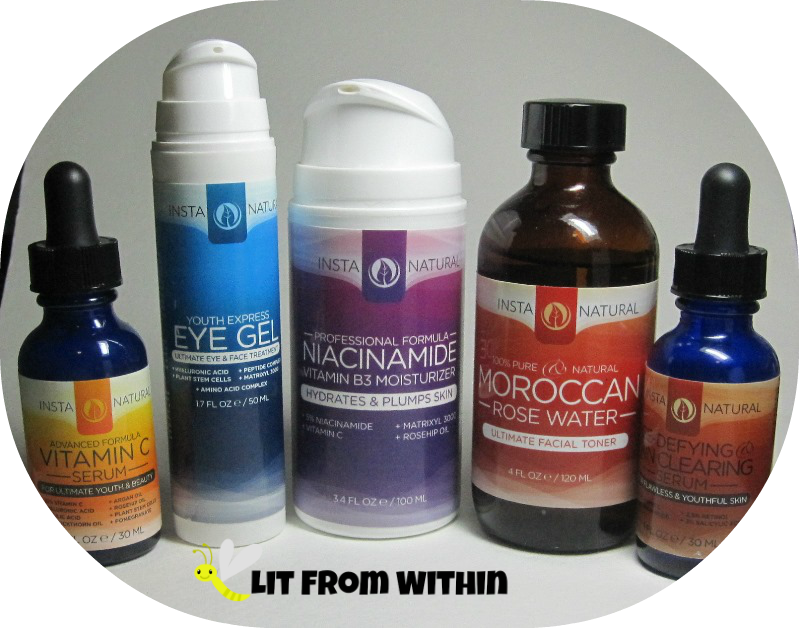 Today, I have a bunch of products from Insta-Natural to tell you about. They run the gamut from one that I think should be named after me, it's like it was made just for me - and one that didn't work for me at all. I remember one of my first Clinique GWP had a little green tube with this wondrous sheer lipstick in it. It looked dark, but applied like a gloss. My first Black Honey! 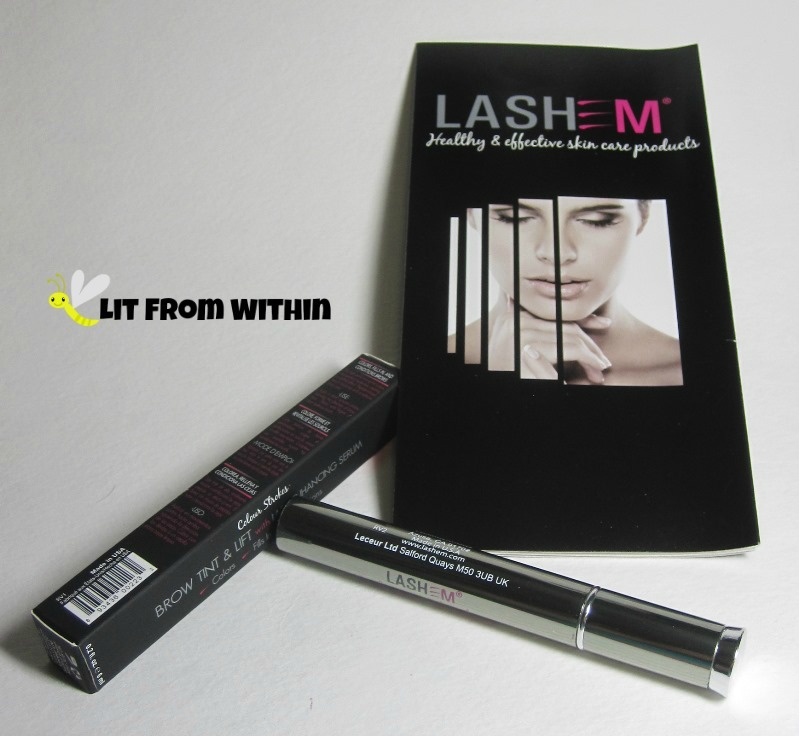 I want to share with you this Black Honey Beauty Gift Set. I've partnered with some other bloggers who also want to show you some of their looks with this set, and there's also a chance to win your own! Ready for another post of 'Nidia Tries Something New and It Goes Sideways As Expected'? Good! Here we go... my first lead-light technique! 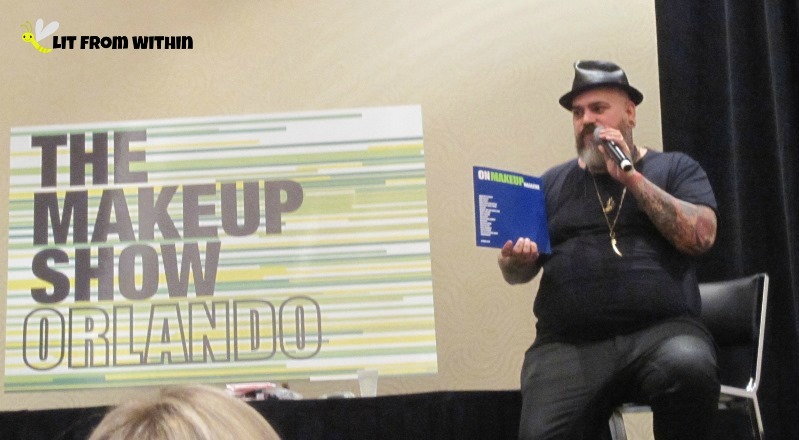 The Makeup Show Orlando Blogger Preview! 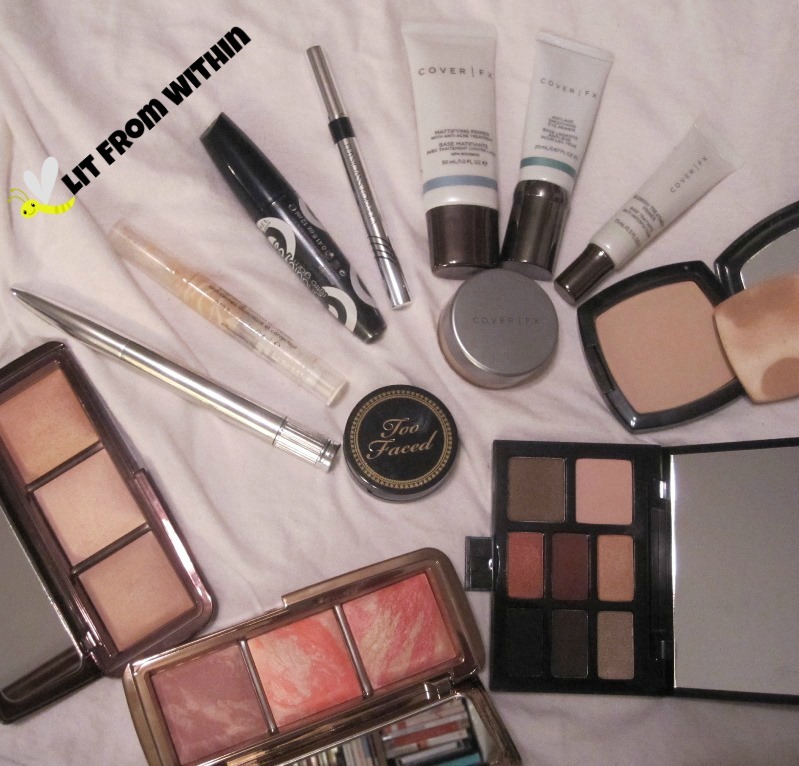 Just a quick post today, because I'm busy at The Makeup Show! Yesterday was the Blogger Preview. James Vincent is a passionate speaker, and I never tire of his stories. We should all be so lucky to love what we do. The focus of The Makeup Show is education and collaboration. James is all about the mentorship,and encouraged us to go forth and meet the people behind the brands, as well as the many speakers at the show. I'm so excited to get back there later today! Have you heard about MDSun? The founder of MDSun, Dr. George Sun, is a plastic surgeon who specializes in biochemical research. He created his pharmaceutical and cosmeceutical lines to give his clients the best products to either maintain their plastic surgery results, or to give the best non-surgical results. 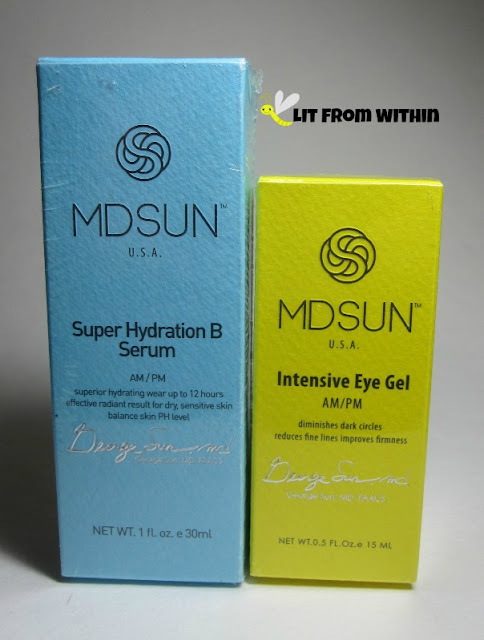 I had the pleasure of trying two of their most popular products: the Super Hydration B Serum, and the Intensive Eye Gel. Did I like them? 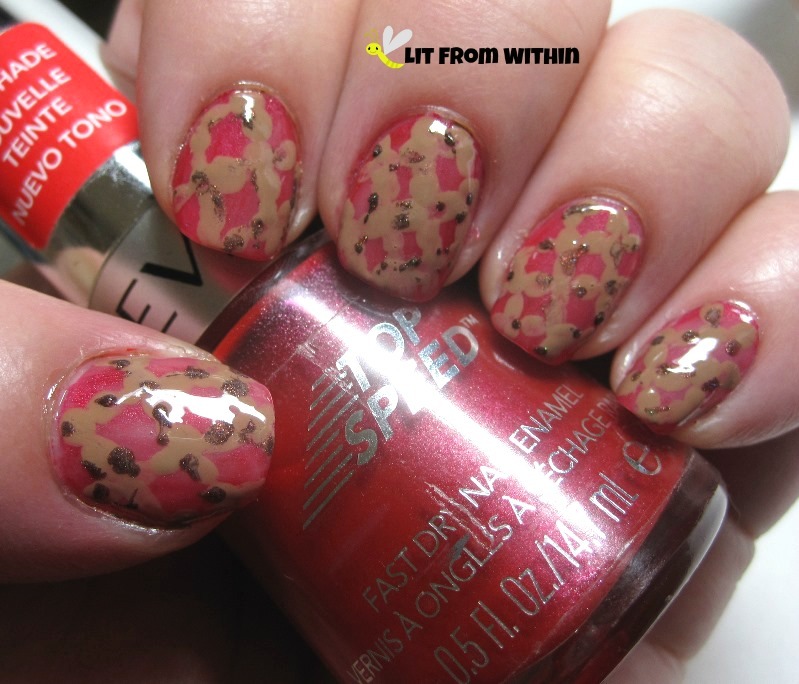 I'll give you a hint - I did one an homage nail art that is one of my most recent favorites! I have recently discovered these caterpillars I have over my eyes, and have been exploring lots of different ways to make them look and act more like proper eyebrows. I haven't tried a lash enhancing serum before...but you know I love my serums! 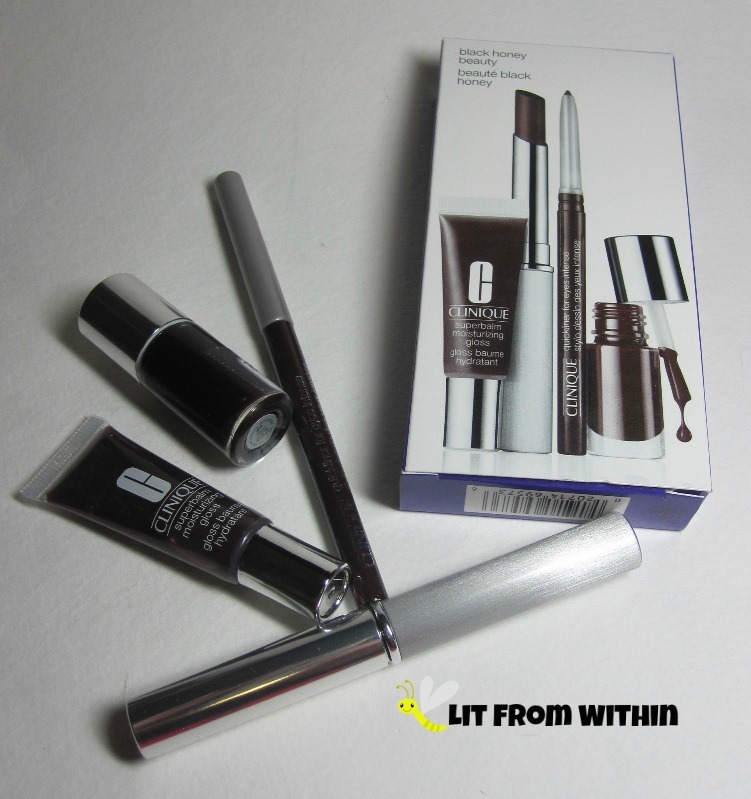 So, I was excited to try this Color Strokes Brow Tint & Lift from LashEM. Still working on the book prompt for this month's challenge, this time I took a book from my husband's desk. He's doing research in this area, and he really likes this book, so I see it hanging around a lot. I thought the matte black cover with the blocks of color would make for a fun mani. After painting all my nails with Cult Nails Fetish, a lovely matte/rubberized black creme, I made blobs roughly in the shape and direction of the ones on the book with different holo polishes. I kinda dig how the holos look over the rubber black. I tried to clean up with a little more Fetish on a teeny-tiny brush, but I really needed topcoat to cover my mistakes! 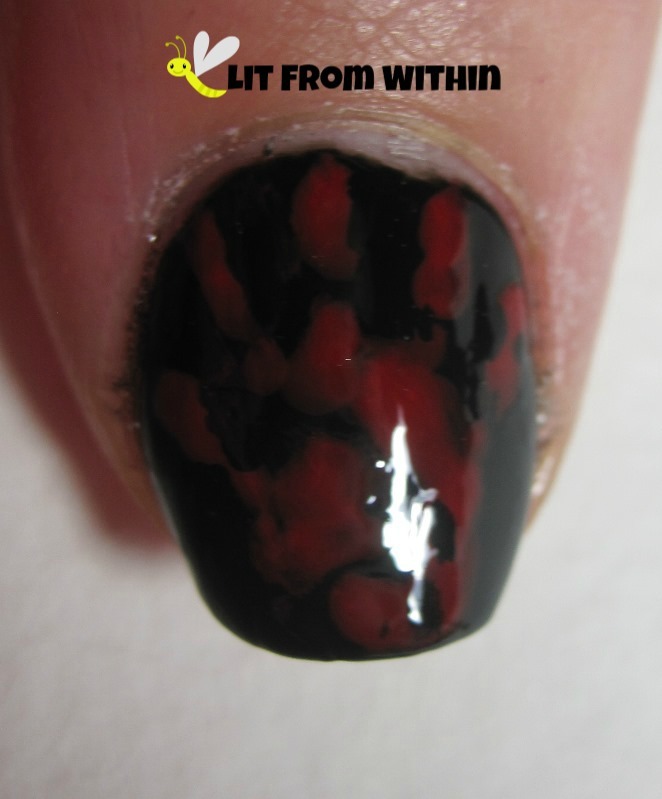 Of course, then the texture of Fetish would change to a glossy black. 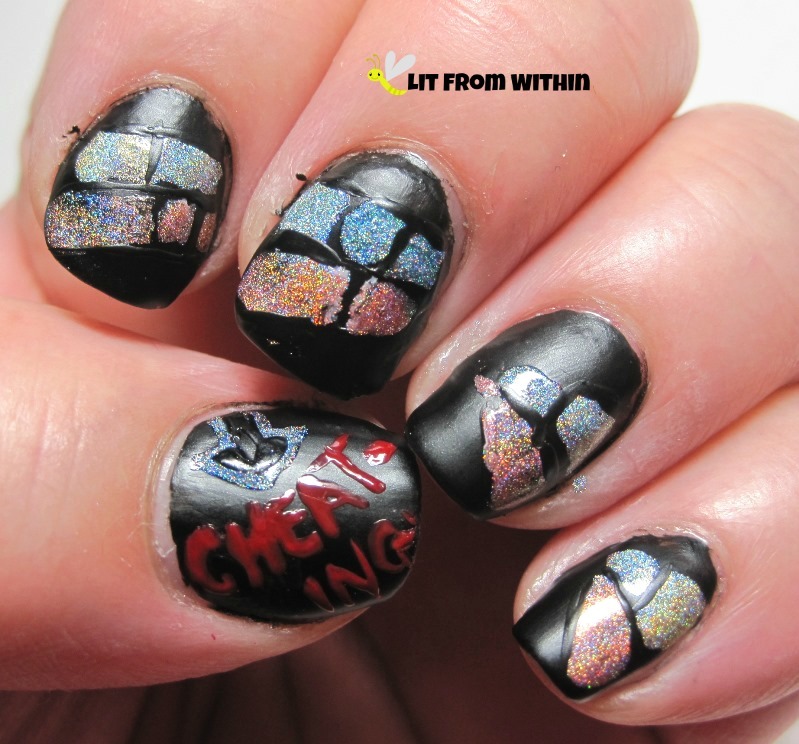 I did the lettering with OPI Over and Over A-Gwen, and that same tiny brush. My kingdom for longer nail beds! lol. Bottle shot: Cult Nails Fetish, OPI Over and Over A-Gwen, Color Club Cosmic Fate, Angel Kiss, and Kismet, and Ludurana Aurora Boreal Magnifica. 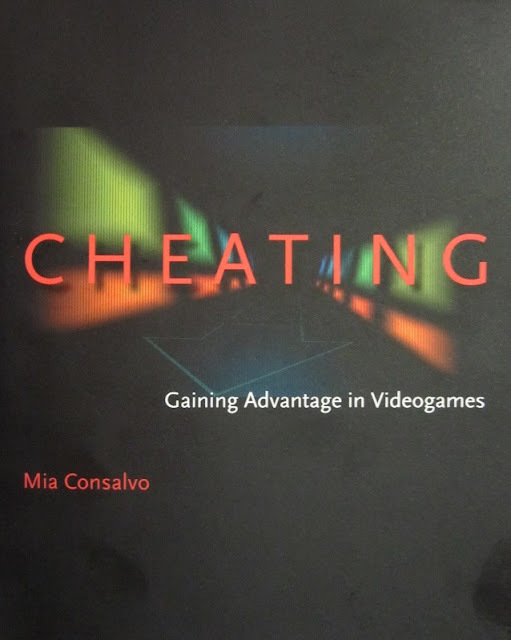 Do you cheat when you play videogames? I remember playing The Sims and putting in the code for more money... all I wanted to do was build houses! I wish I could cheat my way through level 500 on Candy Crush. I've been stuck for weeks. 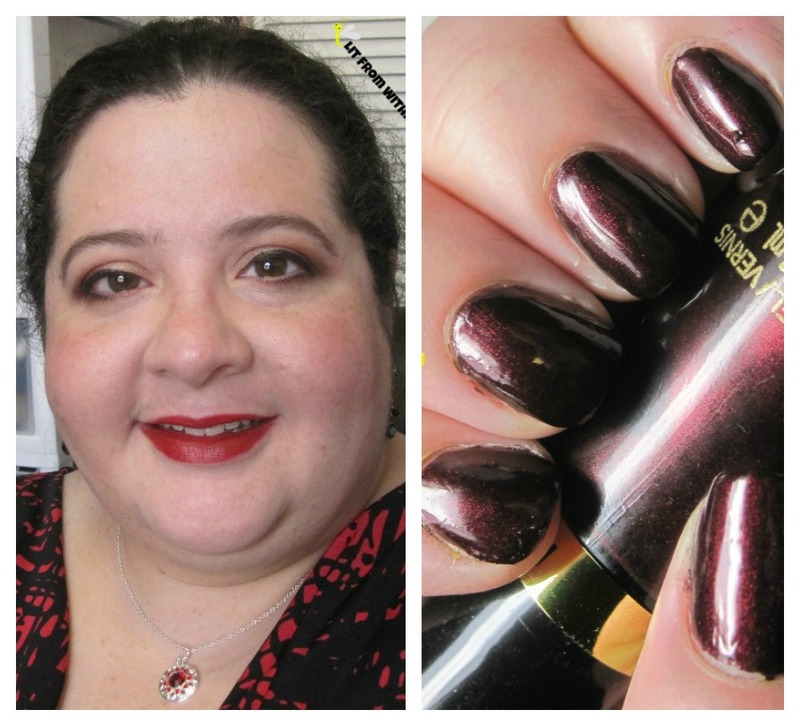 I have a red, vampy look today, from my nails, to my makeup! Let's start with the nails, shall we? This blackened red is the kind of glowing color I fall for every time. 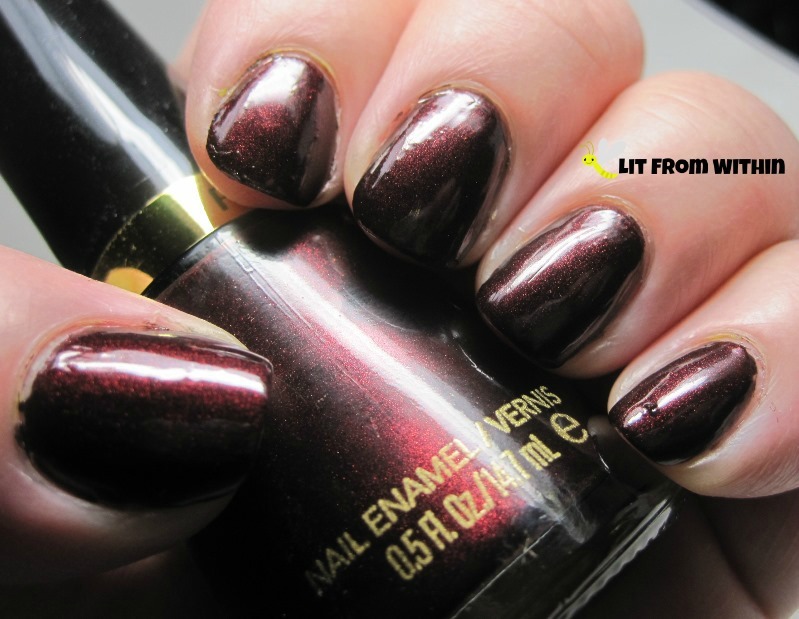 I love how the shimmer makes Revlon Divine look like glowing embers! 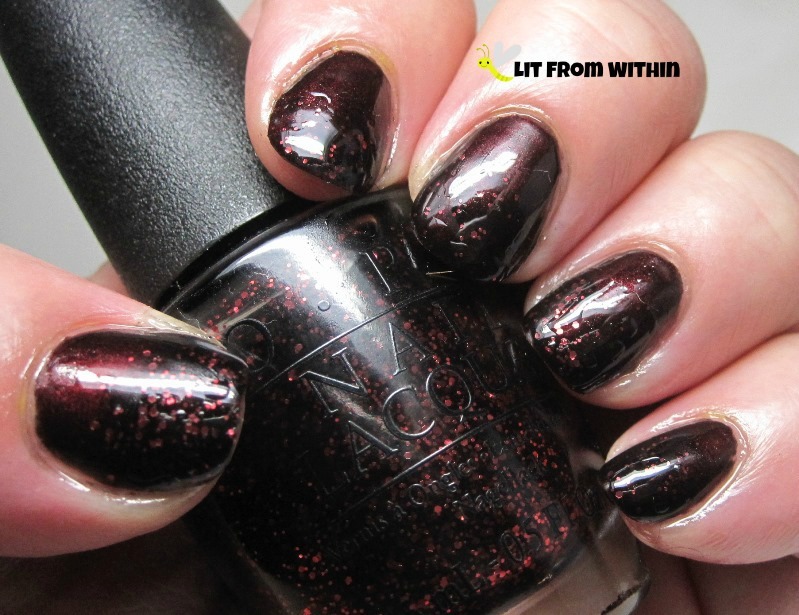 I paired Revlon Divine with OPI Today I Accomplished Zero to punch up the glowing aspect. 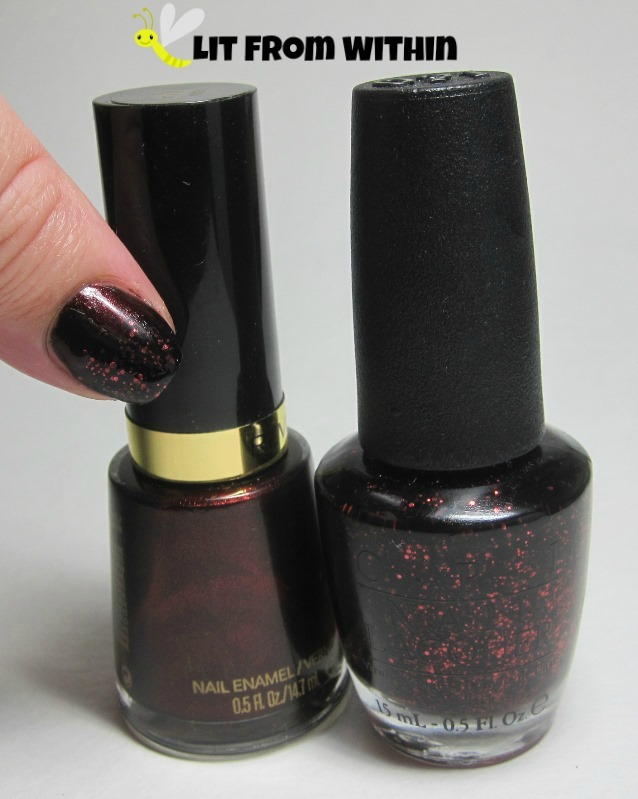 These two polishes are peas in a pod. Polishes in a pod? Bottle shot: Revlon Divine, and OPI Today I Accomplished Zero. 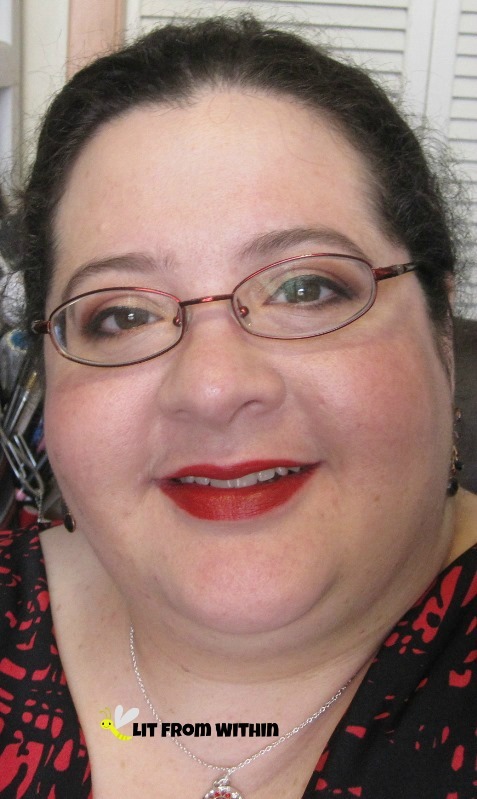 I wore those nails with a red and black dress, so I decided to carry the red and black theme to my makeup. 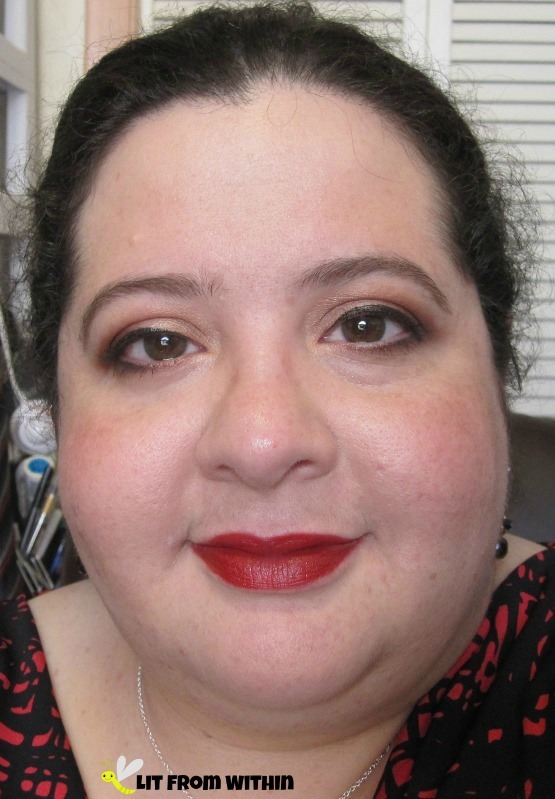 I really love the Smashbox Cherry Smoke palette I used to create this look. The reds are completely wearable, and don't make me look like I've been crying. Boys totally make passes at women who wear glasses. What I used: Hourglass Ambient Lighting blush and powder palettes, Smashbox Cherry Smoke palette, Ageless Derma Powder Foundation in Cool Beige, Cover FX Mattifying Primer with Anti-Acne Treatment, Cover FX Anti-Age Smoothing Eye Primer, and Cover FX Blemish Treatment Primer, Cover FX Powder in Medium (used as bronzer), Physicians Formula 2 in 1 Lash Boosting Eyeliner and Serum in Ultra Black, Rimmel Scandal Eyes Retro Glam mascara, Stila Brighten & Correct concealer, Ellis Faas lipstick in Ellis Red, and Too Faced Bulletproof Brows in Brunette. The MakeUp Show Orlando - PeepShow CreepShow! The Makeup Show is coming to Orlando! I Adore You, Too, Teadora! One Fish, Two Fish, White Fish, Three Blues..
Leftover Halloween Candy? Or Fall Pumpkins?